Dwight Blocker Bowers has one of the best jobs in the country. As curator of the Entertainment History Collections at the Smithsonian’s National Museum of American History, he gets to oversee the institution’s fabled collections of entertainment artifacts, from the ruby slippers Judy Garland wore in “The Wizard of Oz” to a Kermit the Frog puppet from “Sesame Street.” Recently we spoke with Bowers about his role at the Smithsonian, the struggles to compete for objects against deep-pocketed collectors, and his personal passion, costumes. For more information about the Smithsonian’s collection of entertainment memorabilia, visit http://americanhistory.si.edu/. I’ve been at the Smithsonian for 28 years—I never thought I’d stay that long! The first job I had was as a producer and annotator of recordings. We used to have a very active program of archival recordings that we’d release. I came here to work on a set of American popular songs. I remained with the Division of Performing Arts until it was cast asunder and absorbed by the Museum of American History. Then I did public programs, and then I became curator of the Entertainment History Collections. So although I’ve been here 28 years, I’ve performed a number of different functions, all of them having to do with entertainment history. In fact, I’ve always been interested in performance. They tell me that at the age of two and a half, I sat down at the piano and was able to pick out the melody of “Easter Parade.” We have Irving Berlin’s piano in our collection, so I feel right at home here. What I mostly do these days is to try as best I can to make connections with potential donors who own objects that are reflective of an artist’s career. Sometimes you win, sometimes you don’t, but you can always ask. For example, we just put a costume on display that was given to us by Carol Burnett. Actually, the costume came from the guy who designed it, Bob Mackie, but she was very instrumental in telling him that we wanted it. It’s her Went With the Wind dress, which she wore on her television show in a parody of a scene from Gone With the Wind—she wears a dress with a curtain rod balanced across her shoulders. With Carol Burnett, it was simply a matter of her calling up. She said, “Well, what would you like to have?” I told her I was very interested in her television show, meaning the variety show that she did in the late 1960s, early ’70s, and asked her if she had the Went With the Wind costume. She had it. Collectors Weekly: What are some of the other objects that you’ve recently put on display? Bowers: We recently put out Carol Channing’s red Hello, Dolly! dress. That’s certainly something. We have a Phyllis Diller collection here at the museum, so we displayed one of her wooden cigarettes and holders, which was a trademark of her standup comedy routine. She always said, “The cigarette was wooden because I never smoked.” We also displayed the fright wig that she wore. 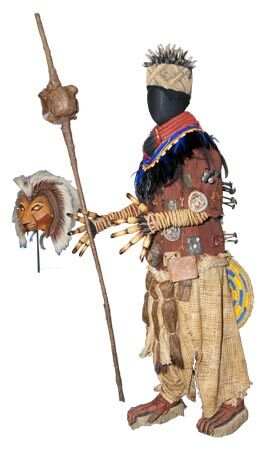 Other recent exhibits include images and photographs from our collection of George Sidney, who was a famous film director at MGM in the 1940s through the 1960s, and artifacts from the stage production of The Lion King. Collectors Weekly: Can you tell us a bit about the process of acquiring a piece, and then preparing it for the public? 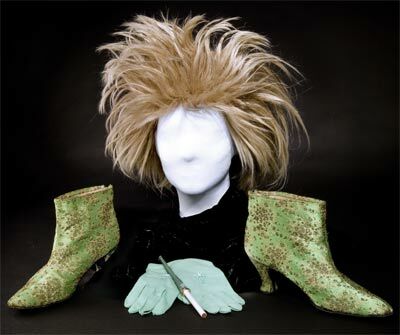 Phyllis Diller donated a fright wig, a pair of shoes, and one of her wooden cigarettes, which she used in her act because the comedienne did not actually smoke. Bowers: Well, the acquiring part is usually a mutual thing. Either we contact the owner of the objects that we’re interested in, or, in some instances, like in the case of Phyllis Diller, she contacted us and invited us to view what she had and make a selection. To prepare a piece, we work very closely with our exhibit staff. For costumes, we work with our conservation staff, which builds a custom mannequin for each costume that we show. And then you work with editors for the exhibition labels. The selection process, curiously enough, is guided by the number of display cases that we have on the floor. In a lot of instances, we match the object that we want displayed with the size of the available cases. So that makes a lot of decisions for us. For a costume case, practically anything in the collection can fit in it. When you’re doing a show that features highlights of our collection, this process works well. But when you’re doing a large thematic show, it’s very difficult to make sure everything fits in preexisting cases. Collectors Weekly: How many entertainment objects are in the Smithsonian’s collection? Bowers: Thousands, but I couldn’t give you an exact number. It’s always something that I have to look up. 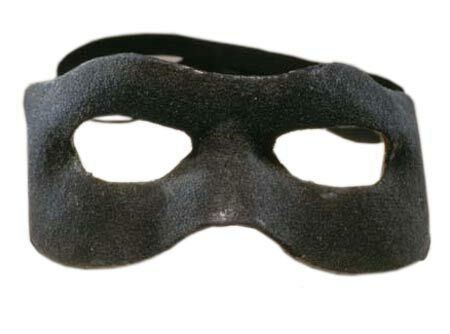 The objects range from the Lone Ranger’s mask, which is very small, to a humongous award that Garth Brooks received from the Recording Industry Association of America naming him the number-one pop solo artist. We probably add 100 to 200 new objects a year, with one exhibition on the floor at a time. That’s primarily because our building is still undergoing renovation. We try to rotate the objects every three months, but we keep the ruby slippers out on almost constant display because the public asks for those daily and gets very irate if we’re not showing them. We probably display less than five percent of what we have in our own collection simply because of limited floor space. Collectors Weekly: And how long does it take to set up an exhibit? Bowers: A day and a half for the scale of what we’re doing right now. For more ambitious things, it can take upwards of several months. But when you’re using preexisting cases and you’re just fitting them with new objects, it doesn’t take terribly long. I long to do something bigger and more substantive. Collectors Weekly: What are you collecting right now? Bowers: Being involved with performing arts, I’m always looking for theatrical costumes and props. But I’m also collecting film items—scripts, props, costumes, and photographs. Right behind that is television. We’re trying very hard to build our collection of television, in particular television comedies. We’re trying to capture the leading situation comedies and programs, as well as the leading personalities in that genre. Collectors Weekly: Are you looking for material from specific years or is it by comedian? 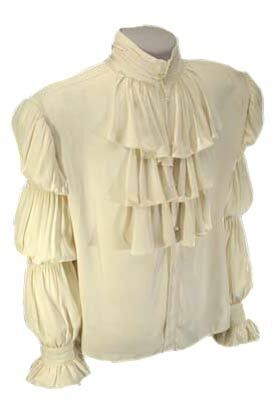 The infamous puffy shirt worn by Jerry Seinfeld in episode 66 of his hit television show. Bowers: We are trying to do specific years, but it depends on whether or not the artifacts are available. For example, we’re finding that materials from the early 1950s are very rare and hard to find. So we’re focusing on the ’60s, ’70s, and’80s. But even that can be a challenge because some TV comedies are focused on personalities, and it’s hard to get a personality into a collection without being a taxidermist. I remember saying that to Jerry Seinfeld when we collected the famous puffy shirt from episode 66. That was such a signature of the show, but I told him, “Short of that, we would’ve gone to a taxidermist because you and your cast members are the show and not the material culture that you handle on the show.” I think Jerry Seinfeld very much wanted the shirt to be part of the collection and so he made it happen. In the ’70s you had similarly popular television shows like Happy Days. Today we find that people are still clamoring to see Fonzie’s leather jacket. We’re pleasantly surprised that the artifact has lasting power. Whenever possible, we like to use video to show the object in use. So if the leather jacket is deemed important, we’d also want to play an episode from Happy Days to show the actor in the costume. In some instances we’re able to do that. In other instances it’s cost-prohibitive because we have to pay rights and royalties just like everyone else. Collectors Weekly: Can you share a few of your favorite collecting stories? Bowers: One of the most recent costumes we acquired was Julie Newmar’s Catwoman costume from the Batman TV show in the 1960s. We knew we wanted something from Batman, and when we spoke with Julie Newmar about the Catwoman costume, as fate would have it, she had it. In fact, with this costume, we also got Julie Newmar’s mannequin that was custom-built to its exact size. She said, “This has been lingering in my bedroom, and I’m perfectly happy to give it to the American public.” So the costume fits it like a glove. In the case of Phyllis Diller, we wanted to document the USO tours to Vietnam that she took with Bob Hope. Not only did she produce an image of herself during this tour, she had her costume and all the props, so quite naturally we went after that. Phyllis Diller also gave us her joke file, which contains more than 55,000 index cards with jokes on them. That file defines her standup comedy career, so it seemed essential when we were documenting her work. Sometimes you ask for things, but they don’t exist anymore. When we were doing an exhibit on Irving Berlin, I asked his estate, “Is there a particular pen or a particular desk that he used to sign a particular contract that was very momentous in his career?” There had been, but they were long gone. Collectors Weekly: Do you keep a backup list? The jacket worn by Mistoffelees in “CATS” includes 40 AA batteries to power its integrated lights. Bowers: Yes. We have ideas of other things that would give us a sense of what an individual was all about. When you’re involved in entertainment history, a large part of what you’re dealing with is celebrity culture and icons of a person’s career. You tend to go for the iconic object so that when the public looks at it, they’ll have an immediate idea of what it is and to whom it belonged. Then it’s our job to tell them more in labels and the context that we place it. We don’t consciously document contemporary culture. We’re not going for the latest sitcom on television because we don’t know yet if it will have lasting power or define its era. We’re trying to find things that do more than just document the personality who either used it or wore it. So, with the Happy Days and M*A*S*H materials, we are looking at the 1950s from the perspective of ’70s and ’80s entertainment. Collectors Weekly: What are some of the earliest costumes you have in the collection? Bowers: We have costumes from stage actors of the late 19th century, including an actress named Minnie Maddern Fiske, who introduced America to the plays of Ibsen, of all people. And we have costumes worn by an actor named Richard Mansfield, who was perhaps America’s first matinee idol. He originated American productions of “Cyrano de Bergerac,” and he played Prince Karl in a non-musical version of The Student Prince. The costumes from that period are made from the most detailed material you’ve ever seen in your life. They’re just absolutely beautiful. In fact they’re quite hardy and are in much better condition than some of the things that we have from later years because they were made of natural fabrics and fibers. The Richard Mansfield costumes came from his widow in the 1920s. This was long before we had such a division to deal with this sort of thing, before there was even a Museum of American History. They came to the Smithsonian primarily as fashion items. The same is true of the costumes of Minnie Maddern Fiske, which came to us from a relative who was just looking for a place to deposit them. They were collected not for their entertainment value but because many of them were made by the best couture houses at the turn of the century. Collectors Weekly: What about puppets? Bowers: We have everything from 19th-century puppets that were used on showboats to Charlie McCarthy, Howdy Doody, and Kermit the Frog. Right now we have two puppets on view—Oscar the Grouch and Kermit. Collectors Weekly: What are some of the challenges you face when working with these sorts of objects? A recent donation to the Smithsonian is Carol Burnett’s “Went With the Wind” costume, designed by fashion legend Bob Mackie. Bowers: Well, one of the adventures is preparing a piece for travel from the donor’s house to us. We build our own boxes of acid-free cardboard and tissue paper and house the costume on some semblance of a form. The other challenge concerns their display. Each costume requires a specially designed mannequin, which takes time to build and a certain amount of cash to make it happen. Our conservator makes each mannequin, but there’s only one of her, and she serves the entire museum, so you can imagine what her life is like. Right now she’s deeply involved in the reinstallation of our First Lady’s hall, so we don’t see her very often. We try to make mannequins that give the costume a little animation, so it doesn’t look too stiff. For example, the leather suit that was worn by Tejano singer Selena is posed and surrounded by theatrical lighting. It’s presented in the setting for which it was created—the stage. In film, costumes usually remained at the studio on racks. If you watch a lot of Turner Classic Movies, you can see a particular costume go from film to film to film. A little bit of it is remade, or it’s reused exactly as it was, and then it went back on the rack. In some instances, these racks of costumes became a part of a studio’s archives. As for the theater, that’s anybody’s guess. Sometimes performers took them home after a show. In most cases, though, they were stored in warehouses where they were easy pickings. Theater items are really rather harder to find, so if you have the chance to get a theatrical costume, grab it because it won’t be there tomorrow. I remember when we were doing an exhibit on Irving Berlin and we wanted something of Ethel Merman’s. We had heard that the costumes from Annie Get Your Gun were still around, and we traced the costumes to this one theater company. I called the director of the company, asked if he still had them, and he said yes. Then I asked if he had a particular Ethel Merman costume. “Oh, no,” he said, “we would’ve reworked it and used the material in another production.” So it didn’t exist. At the time, nobody really thought of these objects as having merit beyond the performance. They were created for a theatrical experience. In the last 20 years, we’ve become aware of how valuable these objects can be, and when Christie’s and Sotheby’s began to sell these objects, we all realized that they had reached a plateau that they didn’t have when they were made. But in the formative years of popular theater or even popular film, we were not cognizant that these were great objects. That’s how it goes when you are trying to acquire a costume. We start out by contacting the theatrical management of a given production. We also ask individuals. For example, we’re starting a collection based on material from Kennedy Center honorees (the response from honorees has been very encouraging). You try a number of different ways to ferret things out. You go to private collectors and ask them if they know where such and such is. You go to other museums and speak with them about what they have and do they know who might have a particular object or a particular costume. You try any different number of ways to track something down. Collectors Weekly: What are some of the most culturally significant costumes you’ve acquired? Bowers: I think probably the Hello, Dolly! costume is one because that show had an enormous impact on the theater. I also think the Cats costumes are particularly good. 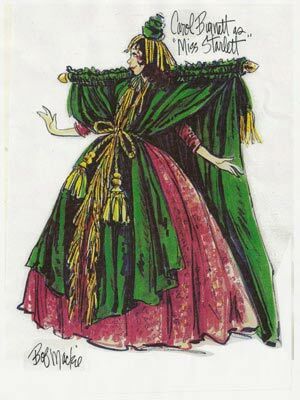 There’s another object that we have that isn’t from a particular production but is part of the theater culture and it’s called a gypsy robe. We have two. These are given to chorus members of various shows—the robe is covered with references to different shows. They’re called gypsy robes because chorus members move from show to show like gypsies, so what they really are is a map of musical theater in a given period of time. Collectors Weekly: What’s the most interesting artifact you have from a film? Bowers: I would love to have materials from the D.W. Griffith era of filmmaking in the 1910s, but we only really go back to the 1960s and the 1970s. One of our better pieces is Dustin Hoffman’s costume from Tootsie, replete with all of the padding that it took to make him into the woman that he played in the film. We also have some interesting vaudevillian material. One of my favorites is a trunk that once belonged to a family vaudeville team. They had a little jumper within their vaudeville trunk to occupy the baby while they’re on stage doing their act. They literally lived in that vaudeville trunk. We have virtually all of their correspondence, their bills, and some of the material that they wrote down that they later used on stage. We have the accordion that they used as part of their act. Collectors Weekly: So sometimes you can collect enough to tell a complete story? This felt-covered “Lone Ranger” mask was designed to fit the contours of Clayton Moore’s face—he played the character between 1949 and 1958. Bowers: Yes. And sometimes we collect that which is representative of a bigger story because we realize that we can’t have everything. For example, we have costumes that Beverly Sills’ mother made for her when she was starting out in her opera career. We have a costume that was made for country singer Patsy Cline by her mother. One of the especially fun things that we have in our George Sidney collection—he directed movies like Bye Bye Birdie, Show Boat, and Annie Get Your Gun—is the pair of chaps he wore at the age of four when he was in a silent movie with Tom Mix. So even at four, George knew he wanted to work in movies, and his parents were theatrical so he had a lot of help. Collectors Weekly: What are some of the things that you’d really like to see in the Smithsonian’s collection? Bowers: I would love to have some of Lucille Ball’s items from I Love Lucy. They currently reside at a museum that’s run by her family in Jamestown, New York. I would like to have something of hers and Desi Arnaz’s. I would love to have his conga drum, which was such a vital part of the music he made and the characters he played on television. Collectors Weekly: Do you find that it’s pretty easy to get someone to donate a piece to the Smithsonian’s collection? Bowers: Yes, I really do. The one thing that we always stress is that we are collecting for the national collection. We can never promise to display anything immediately simply because of the amount of stuff we have and the amount of room we lack. But we usually find most people are very happy to have their things in the Smithsonian. Recently we’ve been talking with the management team around country singer Dolly Parton, and they’re just so pleased to have something representative of her work at the Smithsonian. We’ve talked about a number of things, and though she has not made a decision yet, they’ve been very receptive to our inquiry. I’ll put it that way. Collectors Weekly: Earlier you mentioned Bob Mackie. Who are some of the other top costume designers? Collectors Weekly: What are some of oddest costumes you’ve acquired? 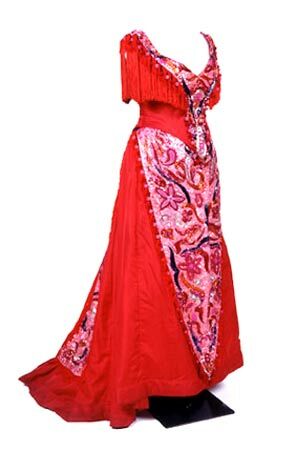 Carol Channing’s famous “Hello, Dolly!” dress. The costume was designed by Freddy Wittop. Bowers: Well, I think people always marvel at the Lone Ranger’s mask and the silver bullet that goes with it. The coat that we have from the musical Rent is largely made of contact paper and newsprint, so that presents a number of conservation problems. And then there’s the costume we have from Cats that’s powered by more than 40 AA batteries—the artist who wears it can light up at will by pressing two metal plates together. That presents conservation issues because of the copper wiring. I love our pair of Ann Miller tap shoes. What distinguishes them is the tap on the bottom of the shoes. The tap is on a plate, so it actually moves. That’s how she got into the Guinness Book of World Records as the world’s fastest tapper. Collectors Weekly: Are there any entertainment objects of historical significance that you feel like you’ve totally missed? Bowers: Yes, one of the great artists that we missed is Michael Jackson. We have nothing of his in the collection. We would love to get something, but our acquisition budget will never compete with the prices of his objects at auction. We try to be savvy. In some instances we make it happen. In some instances we miss the boat. We certainly were in the right place at the right time to acquire the Duke Ellington collection because Congress appropriated funds for the purchase. The collection includes manuscripts, bandstands, musical instruments, and diaries. You name it we have it for Duke Ellington. One of the artists that we’ve tried and tried to collect from is Barbra Streisand, but she still owns most of her collection. The sales of her things benefit her foundation, and we can’t play in that league. I always say that we’re the Blanche DuBois of museums: We depend on the kindness of strangers. Collectors Weekly: So how do you compete with auction houses and private collectors? We don’t have the kind of budget that allows us to acquire things by making a large payment, so we really do depend on people seeing the value of having something at the Smithsonian, and understanding the value of being a part of our collection, without expecting the piece to be immediately put on the floor for display. Collectors Weekly: What if somebody comes to you with a costume or a piece of entertainment memorabilia and wants you to put it in the Smithsonian. How do you decide if you will take it or not? 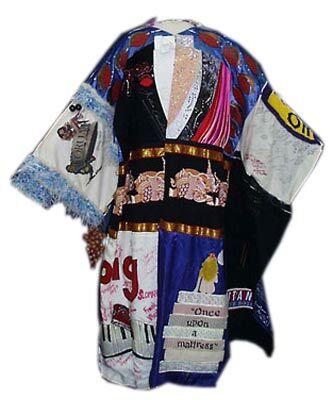 This Gypsy Robe features references to musicals produced on Broadway between 1995 and 1997. Bowers: We try to make our decision based on whether the object has significance beyond a single performer, whether it marks any kind of milestone in American entertainment history, and whether it says something about the American people’s tastes. Those are the questions we ask ourselves. For example, it was a no-brainer to select materials from Indiana Jones because that film had such an enormous impact, beyond just the film itself or Harrison Ford. It drew on the mythos of both American life and the superhero. And we were also very interested in Indiana Jones because we have a large collection of materials from Superman as well. In other instances we try to determine if the object speaks beyond the generation that conceived it. We’re not looking for objects that have a flash-in-the-pan appeal then drop from sight, like, say, the hula hoop. We have hula hoops in the Smithsonian’s collection because they tell us an awful lot about the 1950s, but we’re not interested in the phenomenon of its popularity. One of the current challenges is figuring out how to collect things that don’t exist, such as films made using computer graphics. We haven’t solved that problem. We have animation cels in our collection, but how do you collect source material of television shows such as The Simpsons? How do you collect costumes rendered in computer graphics? With The Wizard of Oz, you can find the actual matte paintings that were used in the filming of certain scenes. But that’s not the case with computer graphics because it’s not something you can hold in your hand. It’s not an object. Collectors Weekly: In general, what do you hope visitors will gain when they see an object at the Smithsonian? Bowers: We’re well aware that nostalgia plays a role in how people look at things from their childhoods, but we’re also hoping they’ll see these things in the context of the American experience and how, in many instances, we’ve used entertainment to define who we are as Americans. 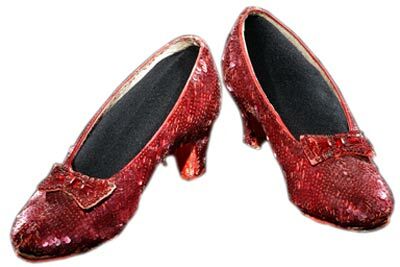 So, the ruby slippers are not just a pair of shoes from a 1939 film; they’re also caught up in the American idea that there’s no place like home. That’s probably why we’re still collecting, still looking for these iconic objects. One such iconic object that I would love to have is the Rosebud sled from Citizen Kane. Steven Spielberg owns that, and since he purchased it, he obviously has every right to keep it. But that doesn’t keep us from wanting it. Do you have any items that may have been used in the 1950s television series, “The Adventures of Superman”? The stars were George Reeves, Noel Neill, Jack Larson, John Hamilton and Robert Shayne.